The soldier emailed me over ten years ago. It was right after 9/11. He said he was stationed on a submarine – he couldn’t tell me where – and that the sub’s small library had one of my novels. He just wanted to say thank you for entertaining him and taking his mind off things. That email got to me. I wanted to do something for him, so I asked my publisher if I could get 10,000 thrillers (not just my books, but lots of authors) donated to the USO. “Sure,” my publisher replied. I couldn’t help but think how easy that was, so I called another publisher. And another. 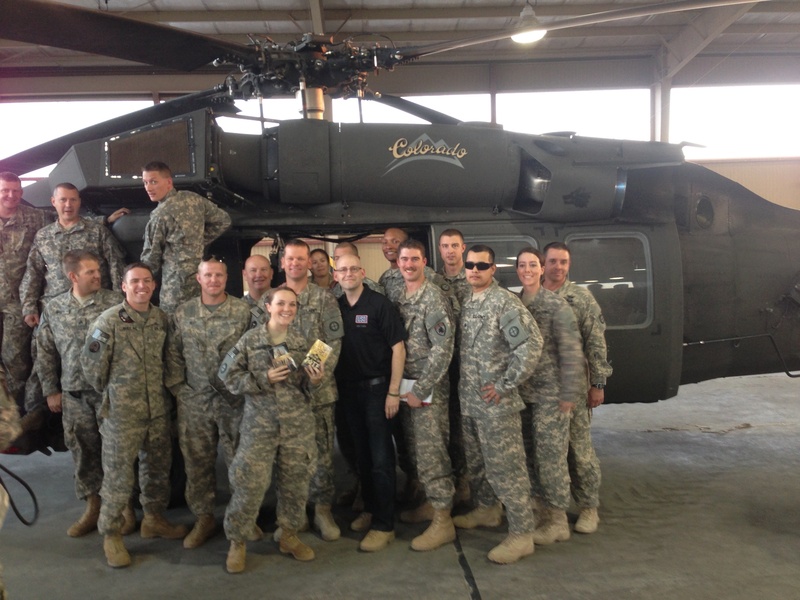 By the time I was done, the USO helped us send 40,000 books from the country’s top authors to our troops overseas. Fast-forward to a few months ago, when I was on a USO tour halfway around the world, entertaining our troops. 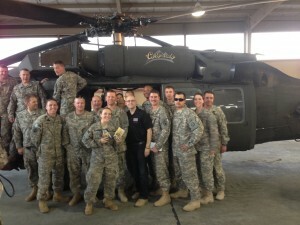 Over the course of ten days, I, along with four other thriller writers, would travel to eight bases in four countries (including Kuwait, Turkey, and two undisclosed military locations), saying thank you to the troops for what they do for us every day. That was the real reason I went: That sailor on the submarine said thank you to me – now I’d get the chance to thank the troops directly. “What’re you talking about?” I asked. I’d barely told anyone about those donations. How could he possibly know about them? I almost fell out of my chair. I had traveled halfway across the globe because, ten years ago, that sailor on the submarine said thank-you to me. And now, as I was trying to return that favor, here was this Captain, also saying thank-you. He had it all wrong. I was supposed to be thanking him! Over the next few hours, we ate together, played pool together, and marveled at one undeniable fact: There is nothing like the power of saying thank you. But wait, it gets better. When I got back from the USO tour, I decided to track down the original sailor who emailed me ten years ago. I needed to thank him. I called him up, telling him this story and everything his thank you started. He seemed quiet, so I asked him if he was okay. After a long pause, he explained that just a few days earlier, he had lost his mother to breast cancer. As the blood seeped from my face, I told him that my mom recently died of breast cancer too. Right there, I could practically feel the universe pushing me forward and telling me the real reason I was talking to this man at this exact moment. “I think I’m supposed to give you this message,” I explained, my own voice cracking. With that, I shared with him the very best piece of advice that anyone gave to me when my mom died: Our mothers never leave us. Ever. Through the silence, I heard his tears. And he heard mine. Sometimes we’re alone in the universe. But sometimes we’re profoundly connected. A decade ago, this man’s thank you put me on a path that lead me across the globe, and then, like a boomerang, brought me back to him at the exact moment he needed me most. So when you’re done reading this article, think of the person who deserves your thanks. An old teacher. A mentor. The person who gave you your first real job. Think of someone who helped you during your life. Go track them down. Say thank you and throw your boomerang. You’ll never believe what’ll come back.